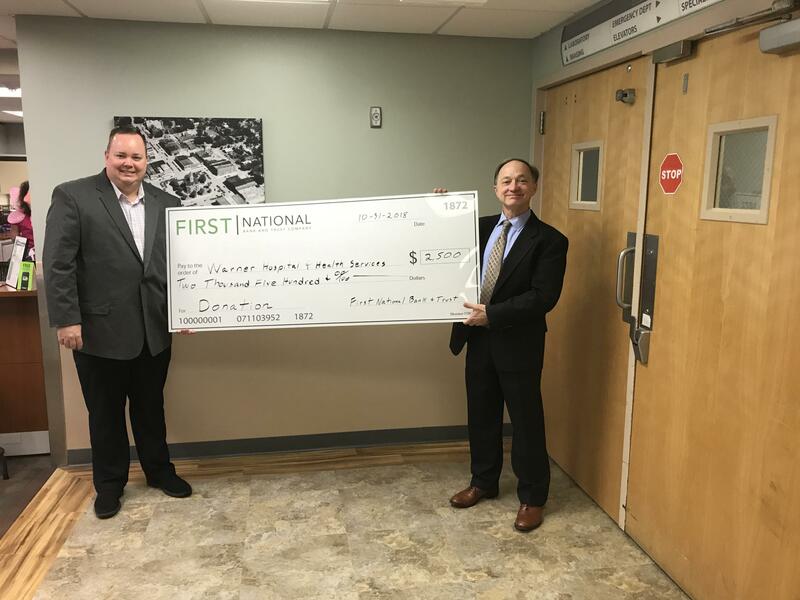 Warner Hospital and Health Services are thanking First National Bank and Trust for its generous $2,500 donation to assist in our efforts to reduce lung cancer. The funds will be made available to the community for people without insurance or other means to participate in the Smoking Cessation classes which is the first step on the way to reducing lung cancer. DeWitt County is ranked number two in the state for lung cancer deaths. Warner Hospital with the help of First National Bank and Trust’s donation is fighting back with lung cancer prevention initiatives. Starting January 2019, Warner Hospital will offer a Freedom from Smoking class. The class is an 8-week course offered through the American Lung Association. For Warner Hospital Family Medicine patients, the hospital has a lung cancer screening program if they qualify. Criteria are you have to be 50 or over, have a 20-30 or more pack year history of smoking, current smoker or have quit within the past 15 years, and have additional lung cancer risk factors. For more information on these great programs, call 217-937-5284 or email Warner Hospital at events@warnerhospital.org.